OEMs and BIOS vendors who want to support the Credential Guard feature of Windows 10. 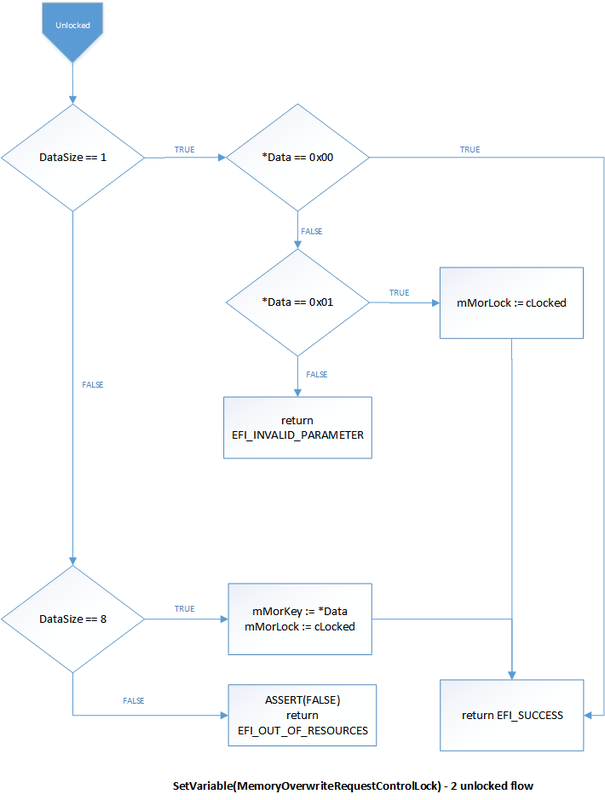 Describes the behavior and usage for the MemoryOverwriteRequestControlLock UEFI variable, revision 2. To prevent advanced memory attacks, the existing system BIOS security mitigation MemoryOverwriteRequestControl is improved to support locking to defend against new threats. The threat model is expanded to include the host OS kernel as an adversary, thus ACPI and UEFI Runtime Services executing at kernel privilege level are not trusted. Similar to Secure Boot implementations, MorLock should be implemented in a privileged firmware execution context that cannot be tampered by the host OS kernel (for example, System Management Mode, TrustZone, BMC, and so on). The interface is built upon UEFI variable services, which are described in the UEFI Specification version 2.5, Section 7.2 named "Variable Services". Note This mitigation, called MorLock, must be implemented on all new systems and not only limited to systems with Trusted Platform Modules. Revision 2 adds a new capability, unlock, to mitigate boot performance concerns, especially on large memory systems. Microsoft recommends removing this _DSM method from modern BIOS implementations. However, if a BIOS implements this _DSM method, it must respect the state of MorLock. 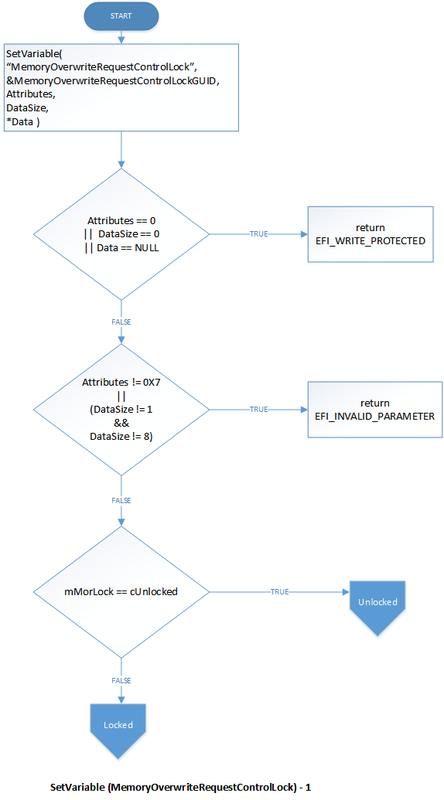 If the MorLock is locked, with or without a key, this _DSM method must fail to change MOR and return a value of 1 corresponding to “General Failure”. No ACPI mechanism is defined to unlock MorLock revision 2. Note that Windows has not directly invoked this _DSM method since Windows 7 and considers it deprecated. Some BIOS indirectly invokes this _DSM method when Windows invokes ACPI _PTS as an implementation of MOR Auto Detection of Clean Shutdown (as described in Section 2.3 of PC Client Work Group Platform Reset Attack Mitigation Specification, Version 1.0). This ACPI _PTS implementation of MOR Auto Detection is security deficient and should NOT be used. On every boot, BIOS shall initialize MemoryOverwriteRequestControlLock to a single-byte value of 0x00 (indicating unlocked) before the Boot Device Selection (BDS) phase (DRIVER####, SYSPREP####, BOOT####, *RECOVERY*, …). For MemoryOverwriteRequestControlLock (and MemoryOverwriteRequestControl), BIOS shall prevent the deletion of the variable and attributes must be pinned to NV+BS+RT. When SetVariable for MemoryOverwriteRequestControlLock is first called by passing a valid non-zero value in Data, the access mode for both MemoryOverwriteRequestControlLock and MemoryOverwriteRequestControl is changed to read-only, indicating that they are locked. Revision 1 implementations only accept a single byte of 0x00 or 0x01 for MemoryOverwriteRequestControlLock. Revision 2 additionally accepts an 8-byte value that represents a shared secret key. If any other value is specified in SetVariable, the call fails with status EFI_INVALID_PARAMETER. To generate that key, use a high-quality entropy source such as the Trusted Platform Module or hardware random number generator. After setting a key, both the caller and firmware should save copies of this key in a confidentiality-protected location, such as SMRAM on IA32/X64 or a service processor with protected storage. 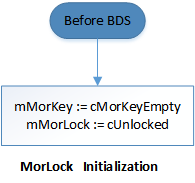 In Revision 2, when the MemoryOverwriteRequestControlLock and MemoryOverwriteRequestControl variables are locked, invocations of SetVariable (for those variables) are first checked against the registered key by using a constant-time algorithm. If both keys are present and match, the variables transition back to an unlocked state. After this first attempt or if no key is registered, subsequent attempts to set this variable fail with EFI_ACCESS_DENIED to prevent brute force attacks. In that case, system reboot shall be the only way to unlock the variables. The operating system detects the presence of MemoryOverwriteRequestControlLock and its state by calling GetVariable. The system can then lock the current value of MemoryOverwriteRequestControl by setting the MemoryOverwriteRequestControlLock value to 0x1. Alternatively, it may specify a key to enable unlocking in the future after secret data has been securely purged from memory. Calling GetVariable for MemoryOverwriteRequestControlLock returns 0x0, 0x1, or 0x2 to indicate unlocked, locked without key, or locked with key states. Note Setting MemoryOverwriteRequestControlLock does not commit to flash (just changes the internal lock state). 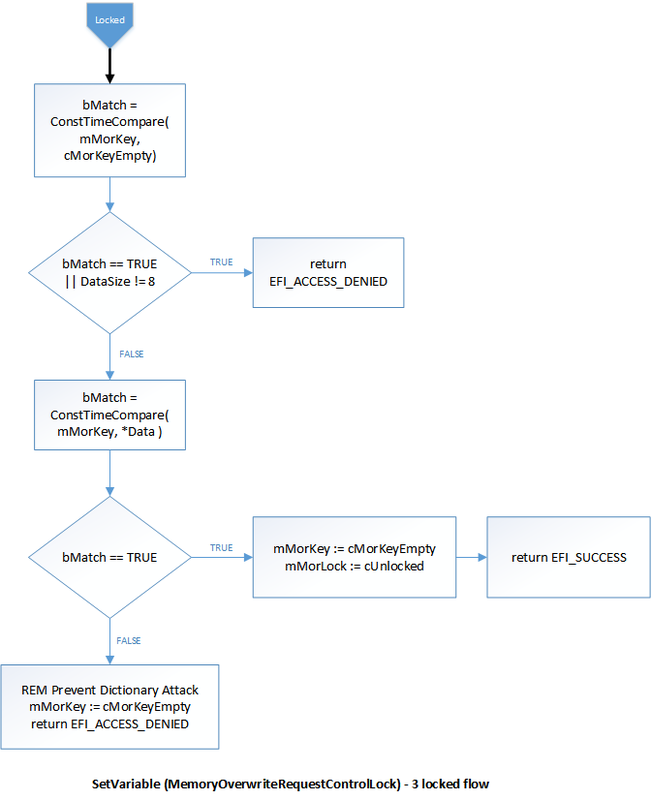 Getting the variable returns the internal state and never exposes the key. The following figures detail the expected behavior.